Jimmy Butler shoots a free throw against the Bucks. A couple of thoughts in the wake of the Sixers’ 130-125 win over the Bucks on Sunday. 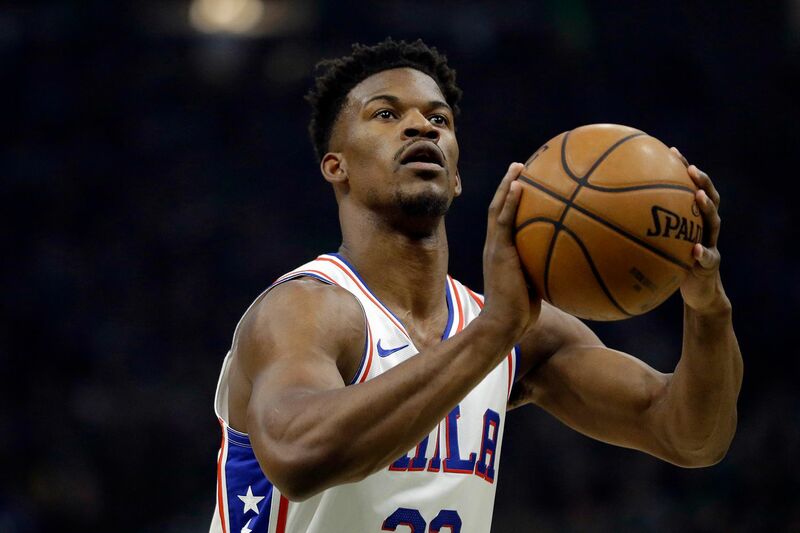 1) Jimmy Butler is a closer, and these last two games are a perfect example of why the Sixers traded for him. It’s an interesting thought experiment to wonder what the Sixers would look like had they passed on Butler, held onto Robert Covington and Dario Saric, and then added Tobias Harris to the fold. No doubt they’d be deeper. You can argue they’d be more well-rounded. You might even be able to make the case that they’d be a better regular-season team. But one thing that is indisputable is that they would not have a player capable of getting them big buckets in tight spaces the way Butler did down the stretch against the Bucks. This was always the rationale for acquiring Butler. The Sixers needed somebody besides Joel Embiid who was capable of taking the ball and creating a shot in must-have situations. That’s what Butler did against the Bucks, and it might have been the difference between winning and losing. For a second straight game, he was exactly the sort of player the Sixers need him to be: decisive, aggressive, engaged. He was their closer, with four of his eight field goals coming in the game’s final six minutes, helping the Sixers withstand a late Bucks rally. Integrating Butler into the offense has been an up-and-down process, but one thing that has been consistent is his performance late in games. This season, 26.7 percent of Butler’s field-goal attempts have come in the fourth quarter and/or overtime. That’s eighth-most among players who have at least 800 FGA this season. It’s also the most on the Sixers. Since joining the team, Butler is 16-for-36 from three-point range in the fourth and OT, a shooting percentage that is 22 points higher than what it is in quarters one through three. That’s the biggest positive differential of any player in the league who has taken as many shots as he has. 2) Embiid is reminding everyone that he should be right there in the MVP conversation. The development of his technical skill over the last year has been a sight to behold. From his footwork around the rim to his body control on the move to the dribble drive that he has begun to incorporate into his game, Embiid’s maturation alone is a reason to think that the Sixers could be a Finals contender this season. I’m not suggesting that Embiid should win the award. Frankly, it belongs to Harden, who has almost single-handedly made the Rockets an elite team despite Austin Rivers’ playing 30 minutes a night. But if the goal is to manufacture a competition, Embiid at least deserves a mention within that second tier of candidates. It’s awfully difficult to build a case against Giannis Antetokounmpo after a performance such as Sunday’s, when he was pretty much the only reason the Bucks were within closing distance against the Sixers down the stretch. He scored more than a third of their buckets, shooting .577 from the field while the rest of the squad shot .405. He had 21 of their 28 free-throw attempts. He finished with 52 points, 16 rebounds, and seven assists. He was, in a word, good. But Embiid was just as good. Maybe not in volume — he had only 40 points, 15 boards and six assists — but if you came away from that game with the conclusion that Giannis had a bigger impact on it than Embiid, well, you watched it with different eyes from mine. Joel Embiid drives between Bucks defenders Giannis Antetokounmpo (34) and Eric Bledsoe. In the end, Giannis probably has a rightful edge in the MVP conversation. This season, his and Embiid’s traditional numbers are virtually identical, with Giannis having the slight edge in points per game (27.5 to 27.3) and Embiid having the edge in rebounds (13.6 to 12.7) and blocks (2.0 to 1.4). Giannis also averages six assists to Embiid’s 3.5. Giannis has been a more efficient player, with a .643 true shooting percentage to Embiid’s .590. But even if we give him the offensive edge, it is a thin edge, and it still leaves us to consider the other 50 percent of the game. Embiid’s presence at the rim is one of those things almost impossible to quantify. We can start by looking at the fact that the Sixers are +4.1 points per 100 possessions better on defense with him on the court than without him. Milwaukee, meanwhile, is +2.5 better with Giannis. But I’m not sure that even tells a deep enough story. Perhaps the tidiest summation of Embiid’s importance lies in the fact that the Sixers are 5-7 in the 12 games he has missed this season. In those 12 games, they have allowed 114.7 points per game, compared with 111.1 in the 58 games Embiid has played. Giannis’ efficiency and virtuoso performances like Sunday’s are a fair reason to favor him over Embiid. But Embiid is unquestionably one of the single most impactful players in the game today. Sunday, you saw it out of him just as much as you did out of Giannis.